Have you ever wondered what goes into determining how much a forklift can really lift? It is a common misconception is that a forklift with a maximum rated lifting capacity of 5,000 lbs. can lift any 5,000 lb. load. This may not be the case depending on a number of factors. First, you have to consider the vertical and horizontal load center of the load that is being lifted, which essentially boils down to the load’s size and weight distribution. The longer, taller, and wider a load gets, the more it is going to affect a forklift’s center of gravity. Since the load center also depends on the load’s weight distribution, an unevenly distributed load can also reduce the overall lifting capacity of the forklift. Second, you have to consider the truck’s capabilities for lift, tilt, and load manipulation. Forklifts are plated as standard for the worst case scenario, which includes all of these factors. The ability to move the load further away from the forklift’s center of gravity by lifting, tilting, or performing a function like side shift can all affect a forklift’s maximum capacity. Speaking of attachments, there are more factors than just load manipulation that can affect capacity. An attachment’s effective thickness tells you how much further the load is pushed out from the truck’s fork face due to the attachment’s size. Its weight also plays a significant role as that increased weight out on the carriage reduces the load weight that the truck is capable of supporting. Different tire types and tread widths also play a significant role. A cushion tire versus a solid or air-filled pneumatic tire, for example, can have an effect on capacity. Wide tread and dual tire configurations can also increase a truck’s overall capacity due to the wider stance increasing the size of the forklift’s stability triangle. Battery weight on an electric truck can also have an impact, which is one reason why using a battery that meets the truck’s minimum battery weight requirements is crucial to safe operation. One thing to also keep in mind is that the forks, each attachment, mast, and carriage all have their own individual rated capacities. The capacity listed on your data plate cannot exceed the maximum capacity of any load bearing component. For example, if you have a 10,000 lb. 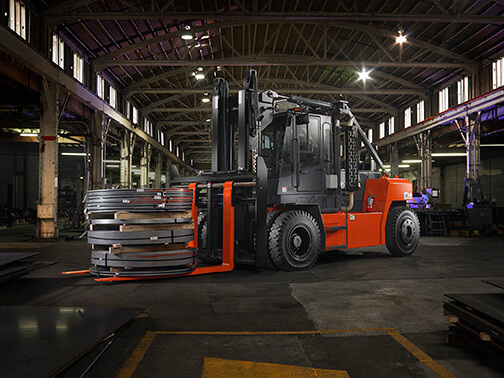 capacity forklift with an attachment that is only capable of handling 5,000 lbs., your maximum rated capacity for the combination of these two is 5,000 lbs., which is what will be listed on your data plate. It is important to remember that both ANSI and OSHA require data plates for each attachment and written approval from the forklift manufacturer for any modifications or alterations that may affect the capacity, stability, or safe operation of the forklift. There are two different ways for a manufacturer to calculate capacity per ANSI B56.1 Section 7.6.3. The first is a tilt table test, which requires a forklift to be chained down to a tilt table and tested per the requirements outlined in ANSI B56.1 Section 7.6.4. The second is for manufacturers to calculate the forklift’s capacity based on factors like the ones mentioned above. Tested capacities are typically higher than calculated ones due to the conservative nature of the calculation, but this is not always the case. The factors listed above are but a few of the primary factors that will be used to calculate a forklift’s rated capacity. Ultimately, it’s best for you to work with your local, authorized Toyota dealer when it comes to properly configuring your forklift for your application and load handling needs. This is especially important during the purchasing process, but also in regards to any modifications you may make to your forklift after receiving it, including any attachments that you plan use on the forklift or those acquired later on. For more information regarding forklift modifications and best practices, be sure to read this piece on forklift field modifications.